As Gab is going to be 12, getting his own ID card this coming March, to get his first mommy - made wallet is the best idea of all. Tried many searching, and I am glad that I found this one from Noodlehead - Simple and basic wallet for boy. Dug out the fabric I used for his lunch box sack, which is a dark brown Japanese yarn dyed fabric, and a piece of newly bought cotton lining. There was a mistake on measurement in Noodlehead post. From the exterior wallet fabric cut one piece 8.5" wide by 4" tall. Also from the lining fabric, cut one piece 8.5" wide by *10.5" tall (this is for the card holder slots)"
*Please use 10" instead of 10.5"
After lunch bag sack, I have made him a recycle bag for school exercise books, a waterproof school bag cover though it never being used before, a coin pouch for plasters and alchohol swabs. 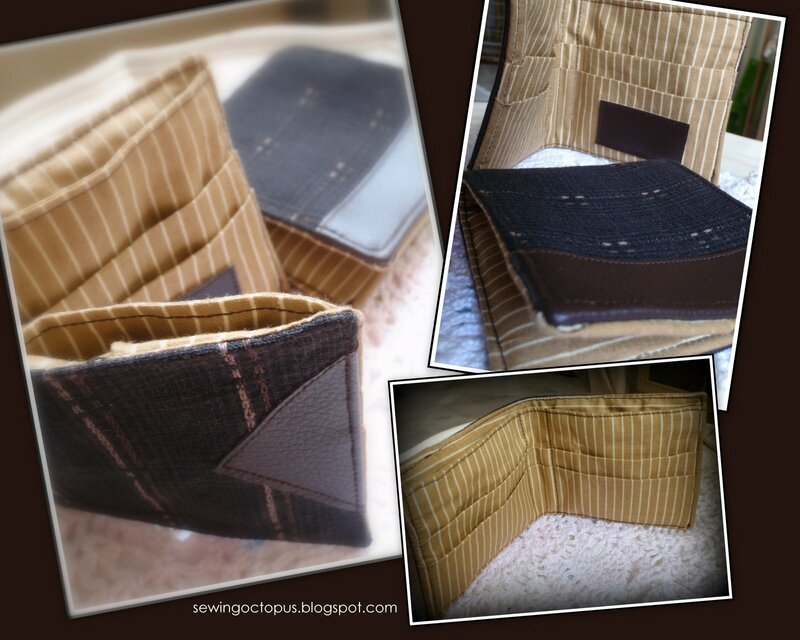 I am glad that I get something to sew for boys, I would love to sew more in near future. Well ... a son, that is all I have.